I thought I'd share three things that I have learned (or remembered) recently. They're all pretty obvious but there are times when it's easy to put your foot in it and have regrets afterwards. 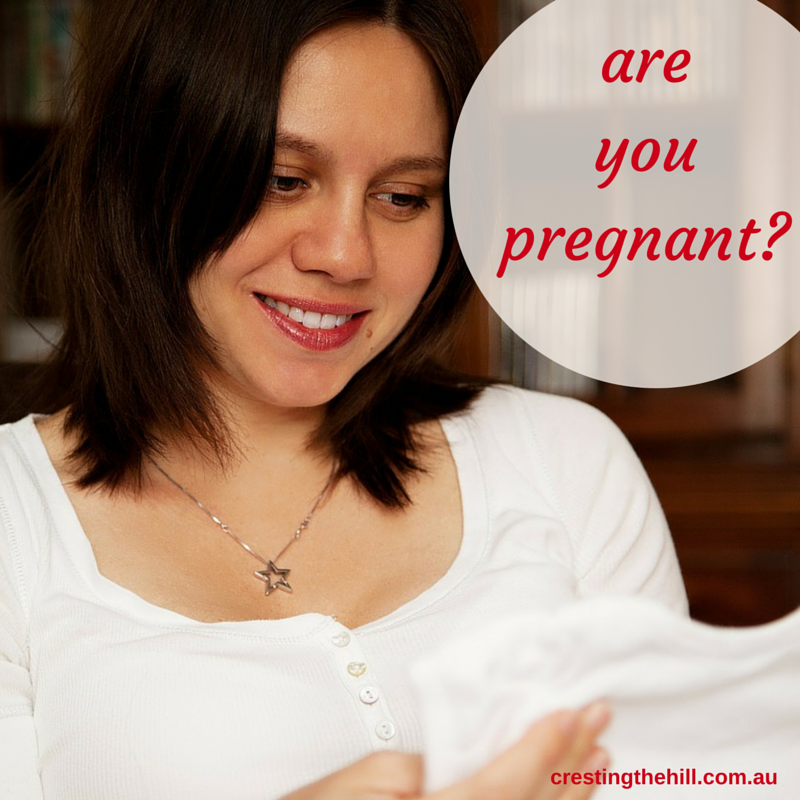 Thing #1 When is the right time to ask someone if they're pregnant? This is a question that has come to the fore recently with the "children" of friends starting to produce babies. And the answer to the question (for those who are wondering) is NEVER! Pregnancy is such a personal topic - it's wonderful when new parents-to-be share their news, but for those who are trying (and often failing) to fall pregnant, having a well meaning person ask them how it's going is really not helpful. The same goes in the first trimester when there is so much happening - a lot of couples like to keep their news to themselves and don't want to have to lie to the person asking the question. The middle part of pregnancy is easy because you'd have to be a blind man on a galloping horse to not know that a woman is 6 months or so pregnant - so the question is irrelevant. But it's not so easy to figure out in the early post pregnancy stage. I remember the first (and only) time I got this wrong was when I was a young woman at the hair salon and I asked my hairdresser when her baby was due - turned out she'd had it already and what I thought was a pregnant midline was her remaining baby weight! I was fortunate to walk out with hair left on my head! So, lesson learned is - wait til the people involved tell you and don't ever ask someone if they're pregnant. Thing #2 Never offer your opinion or give advice to your adult children unless they ask for it. Then only give it sparingly. In this area I am still a work in progress. It is so hard to keep my mouth shut when I want to offer some helpful suggestion to my children. The fact that they don't need my "help" isn't the point - I feel like they just don't realize how much experience I have and how much easier it would be if they just listened to my wise words. Watching your children make their own decisions (and sometimes mistakes) is one of those lessons in independence creation. I am so proud that my "kids" are out there making it on their own, but that doesn't stop me thinking I know what's best for them and wanting to leap in with advice. Sometimes it's about trying to save them from making the same mistakes we've made, and sometimes it's just because I think I know best - neither is a good reason to interfere if I haven't been asked. Even when I am asked, I have to reel in the volumes of stuff I want to say and try to only give what's specifically asked for. It is getting easier as time goes by, as they establish their boundaries and create their own family units. After much trial and error (and being shut out of communications at times) I have worked out when to keep my mouth shut (usually). My sister-in-law says she can tell when she's overstepped the line by the shutters closing on her daughter's face. That's when you have that oh-oh moment and start back pedaling as quickly as you can. Safest not to go there in the first place! Thing #3 Never 'criticize' a person's appearance unless it can be fixed in less than 10 seconds. This is something that I read recently on Tumblr and I stopped and thought about it for a moment and it made a lot of sense. There's no point telling someone you don't like their new hair colour, or their tattoo, or the colour of the shirt they're wearing. They can't do anything about it and it only causes hurt feelings and resolves nothing. When I thought about the 10 second rule (as I now refer to it), it covers a lot of ground where your comment might not be complimentary, but it can make a positive difference. 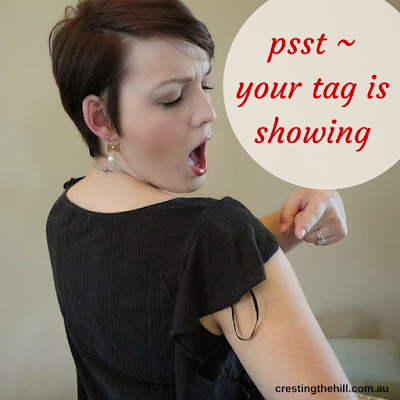 A couple of examples that leapt to mind included the pesky tags and loops that I mentioned in a previous post long ago. It is a kind service to tuck in a friend's clothing tag or tell them it's sticking out - they can tuck it back in 5 seconds flat and look a lot tidier in the process. Food stuck in your friend's front teeth, or the dreaded lipstick smear are also easy to correct and can save the other person a little embarrassment along the way. I'm sure there are a multitude of little things that could be covered here but I thought I'd quit while I was ahead - feel free to add any extras in the comments section! These are ALL so good! 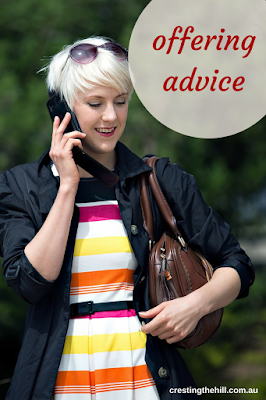 I'm very careful about handing out advice to my adult kids---only if they ask for it. I also NEVER ask if someone is pregnant because it has happened to me (I have a wine belly, LOL!!) several times over the years. The last time it happened, I was 48 years old and mortified! But my sister brought up a good point---she sad, "Hey, at least they thought you were still YOUNG enough to be pregnant!" thanks Abby - someone asked me if I was pregnant in a photo they saw of me - nope just a bit of belly bulge - that seems to be getting worse as the years go by! These are wonderful. I especially like the "fix in 10 seconds" one. When I was in college I once went around for hours with a smear of fluffernutter on my lip--like a mustache and nobody told me. I always hope someone will mention it to me if I've got green in my teeth but at the same time I hate telling someone about their "fluffernutter" (love that word) but sometimes you've got to be cruel to be kind. Now I'm off to google fluffernutter! Oh yes! I made the pregnant mistake - but only when I asked someone whether they had had a boy or a girl! Turns out her kid was 21 and she had a paunch! ;) Never again. exactly right Sue - if you have to ask then they probably aren't pregnant or don't want people to know! Oh, the 10 second rule is brilliant! I'm using that from now on. I so understand #2! My whole family does this to me (probably because I am the youngest) and I hate it!!!!!! So I don't do it to my out-on-her-own adult daughter. I so agree with these points, especially #2. No matter how old I am, I still get it!! Grrrrr.